Pancit Bihon is a popular Filipino noodles made using rice noodles, meat and vegetables. 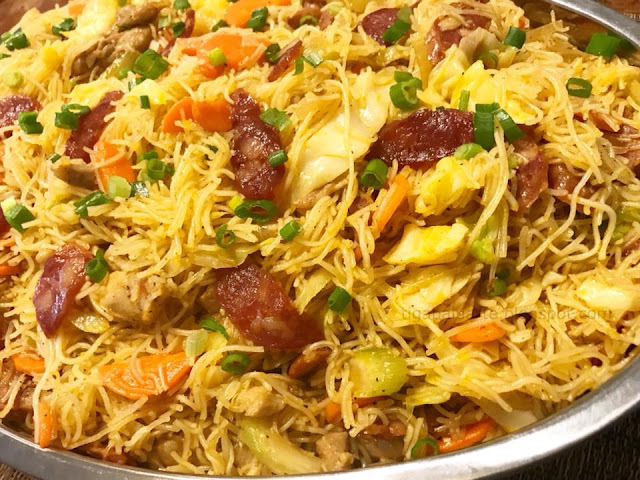 This Filipino noodle dish is easy to make and always present in every Filipino occasion. It is also called Bihon Guisado (sautéed) or Pancit Bihon Guisado. Remove noodles from the package and soak in water for about 10 minutes. Once noodles starts to soften, remove and place in a colander to drain excess water and set aside. Using a large wok, heat in medium heat and add cooking oil. Add Chinese sausage and cook for about few minutes and remove from the wok. Set aside. Using the same wok, sauté onion and garlic until caramelized. Add chicken pieces, stir and cook for 5 minutes or until chicken is fully cooked. Using the same wok, add around 1 to 2 cups of water. Simmer in low heat and add ground pepper and soy sauce. Add soaked noodles to the wok and mix well. Add achuete oil and mix well. Add cooked Chinese sausage, sautéed chicken and vegetables and mix well. Cover and continue cooking in the lowest heat. Drizzle with sesame oil and stir well. Stir every few minutes to avoid the noodles from sticking to the bottom of the wok. Continue cooking until noodles is fully cooked. Season with more salt and ground pepper if needed. 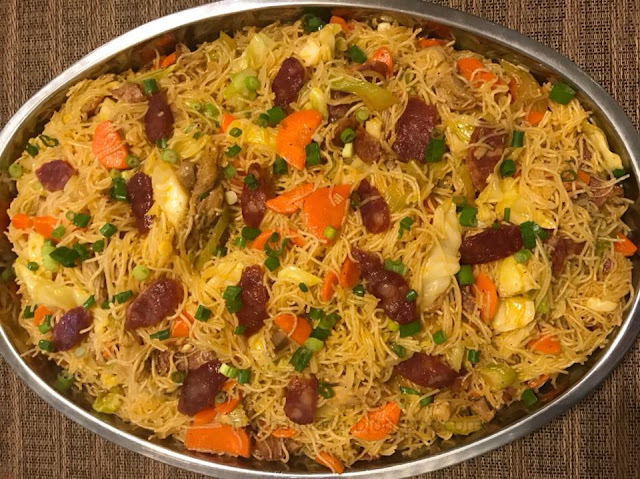 Transfer cooked Pancit Bihon is a serving dish, top with chopped green onions and serve hot with slices of kalamansi or lemon or lime for garnishing. Noodle brand varies, some brand do cook faster than others so use of water may differ. It's always safer to start with lesser water and add more if needed. If more water is needed, remember to use hot water. Instruction 6 and 7: Reduce heat to the lowest heat as possible to avoid the noodles from drying fast. Instruction 6 and 7: Cover wok to allow the steam to cook the noodles evenly.